Dizziness, light-headedness and problems with balance are distressing, but can also cause major problems in everyday life, including nausea, problems with co-ordination and walking, and falls that are more frequent. Up to two-thirds of people with fibromyalgia syndrome have problems with dizziness to some degree. In a study carried out in the USA and published in 2009, which compared people with and without fibromyalgia syndrome, people with fibromyalgia syndrome had worse balance that those without the disorder. They also had worse scores on ‘balance confidence’, and had many more falls – for example a 50-year old with fibromyalgia syndrome had numbers of falls equivalent to a 70- or 80-year old without the disorder. What Causes Balance Problems and Dizziness in Fibromyalgia Syndrome? It’s not completely clear what causes balance problems and dizziness in fibromyalgia syndrome. Fibromyalgia syndrome trigger points in the neck or jaw can cause a feeling of dizziness and imbalance. This may be because they affect the nerves that tell the brain where the body is in space, so if these signals do not match with the signals from the eyes, this could cause dizziness and disorientation. Dizziness and light-headedness could also be caused by neurally-mediated hypotension (also known as the vaso-vagal reflex) – a drop in blood pressure and heart rate. It can also cause sweating, fainting and falls. There is a physical abnormality in the skull known as the Chiari malformation that puts pressure on a specific area of the brain. This can bring on symptoms of neurally-mediated hypotension, and in a study in the USA, it was seen in 60% of people with fibromyalgia syndrome. Some medications can cause light-headedness, dizziness and balance problems. 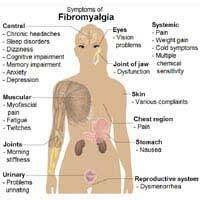 People with fibromyalgia syndrome tend to take more medications than the general population, and so it’s worth talking to a doctor or pharmacist to see if this might be the cause. Make sure that the house and workplace is free of trip hazards, such as cables, rugs and obstructing pieces of furniture, and watch out for sharp objects and corners that could cause an injury after a fall. Try not to stand up too quickly after sitting or lying down, or bending over, as this can cause the dizziness or make it worse. Balance exercises can help with balance problems – try dance, yoga, Tai chi or Pilates, sit on an exercise ball, stand on a wobble cushion, walk a line heel to toe (and then backwards again if you can), or just try standing on one leg. The Alexander technique can also be helpful – it focuses on good posture and helps with balance and co-ordination. Exercise also helps with other symptoms of fibromyalgia syndrome. People with problems with balance can sometimes find walking awkward, and find that they stumble more easily – try using a pair of walking poles, especially when it’s icy, or on days that dizziness is a particular problem. Stumbling and falls can also destroy confidence – using walking poles, even if not always needed, will give extra confidence, and provides a visual reminder to people that walking may be a bit of a problem. Really worried. Diagosed with Fibromyalgia, IBS in 2015. Depression and anxiety followed. Was off work for almost 6 weeks at the start of the year following Flu. Was forced to see Occupational Health when I returned, who were very nice and understanding, but suggested I reduce my hours. I currently work 28 hours in a primary school. I now have irritable legs, insomnia and feel very light headed all the time. Can't afford to cut my hours any more and need my job to have something to focus on. Really struggling though and worried how I will cope financially if my employer loses patience and I lose my job! So, pretty much YOULL NEVER know if allergy hives or contact fibro hives? Having been in hospital with solvable medical problems so much I had forgotten my fibromyalgia.it hid so well behind a heart attack, c.diff, gall bladder removal that now these are behind I find that a lot of problems now unanswered by doctors are the culprits caused by my fibromyalgia. Thanks for these articles. I suffer the most from the dizzy and blood pressure ups and downs that my cardiologist could not find the reason.I will share with him now. Thanks a lot. You're welcome. I hope now that your other health problems have been recified, you manage to sort out your fibromyalgia problems and find a way of dealing it, so it is at least manageable. Having been in hospital with solvable medical problems so much I had forgotten my fibromyalgia...it hid so well behind a heart attack, c.diff, gall bladder removal that now these are behind I find that a lot of problems now unanswered by doctors are the culprits caused by my fibromyalgia. Thanks for these articles. I suffer the most from the dizzy and blood pressure ups and downs that my cardiologist could not find the reason...I will share with him now. Thanks a lot. i also find that i cannot walk in a straight line sometimes, and walk to the side sometimes walking into other people. i can feel my muscles tightning as a walk and they become very painful resulting in me having to take a rest.